Goals from Roberto Firmino, Sadio Mane and Adam Lallana ensured Liverpool took all three points from their opening home game of the season in front of a packed house at Anfield. The champions threatened to find a way back into the contest through Vardy's strike but the Reds held on. 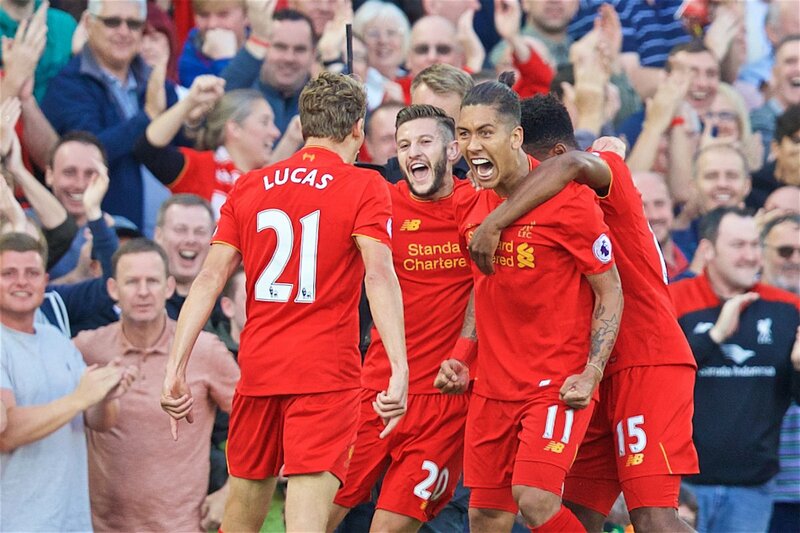 122 days on from the last time Liverpool played in front of a home crowd, Jurgen Klopp's men walked out on to the hallowed turf of Anfield Road with an extra 8,500 expectant supporters firmly acting as the 12th man thanks to the extensive expansion work done on the Main Stand throughout the summer break. Both sides had made identical, off-the-pace starts to the season with a win, a loss and a draw apiece leaving either team languishing in mid-table. The champions set the pace early on without really creating much; Pressing the host's backline and not allowing the likes of Henderson and Wijnaldum to dally on the ball. 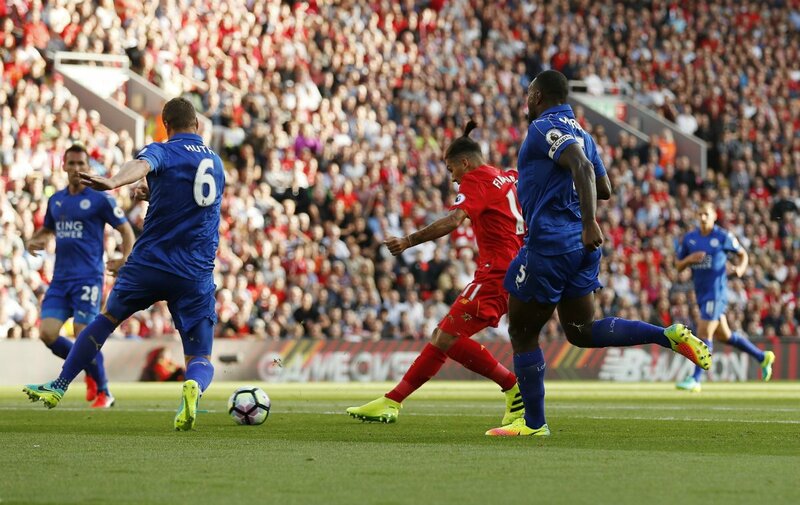 A dummy from Daniel Sturridge had Wes Morgan sweating soon after before Roberto Firmino sliced a weak shot at Schmeichel from 20 yards. It was a warning sign for Leicester, as the next attacking wave forward resulted in the Brazilian giving the Reds the lead. A burst upfield from James Milner, still deputising at left-back, ended with the Englishman driving a pass in to Firmino on the edge of the box and a nimble touch to get away from Morgan allowed him to slot past Schmeichel for the first Anfield goal of the season. More intricate work from Liverpool's attackers almost doubled the lead,as Sadio Mane's square pass fell at the feet of Daniel Sturridge, who's shot was smothered by Schmeichel, no doubt the busier of the two goalkeepers in the first half. On the half hour mark, Sturridge was heavily involved again as he turned provider with a backheel to tee up Sadio Mane. The Senegal winger made no mistake with a chip to double the lead and leave Leicester in dire straits. Just as Klopp's game plan began to shape up and heavily expose Leicester's weaknesses, his side manufactured their own downfall. Namely, Lucas Leiva, who inexplicably gifted possession to Jamie Vardy just six yards out from goal. The England striker pounced and reduced the deficit before the break. A talking point from this goal was realised later on down the line as TV replays showed Shinji Okazaki had crept into the penalty area before the goal-kick had left the danger zone, deeming the goal illegal under Law 16. Liverpool tried to rebuild the exceptional momentum they had built up after the break, and eleven minutes after the restart they restored the two goal lead. Daniel Sturridge had raced forward through on goal but a poor finish left the 54,000 in attendance sighing with frustration. However, the Reds recycled possession and the ball found its way to Gini Wijnaldum, who teed up perfectly for Adam Lallana to rocket the ball into the top corner. It was truly an unstoppable strike. Then, in the 79th minute skipper Jordan Henderson should have well and truly killed the game off when found with an eternity of time to pick his spot from 12 yards. However, excitement inevitably kicked in as his shot ballooned over into the Kop. Jamie Vardy and Sadio Mane went close at both ends with brilliant saves to deny them from Mignolet and Schmeichel before a truly magnificent counter attack ripped apart Leicester's defence and Firmino notched in his second goal to make it a thrashing. 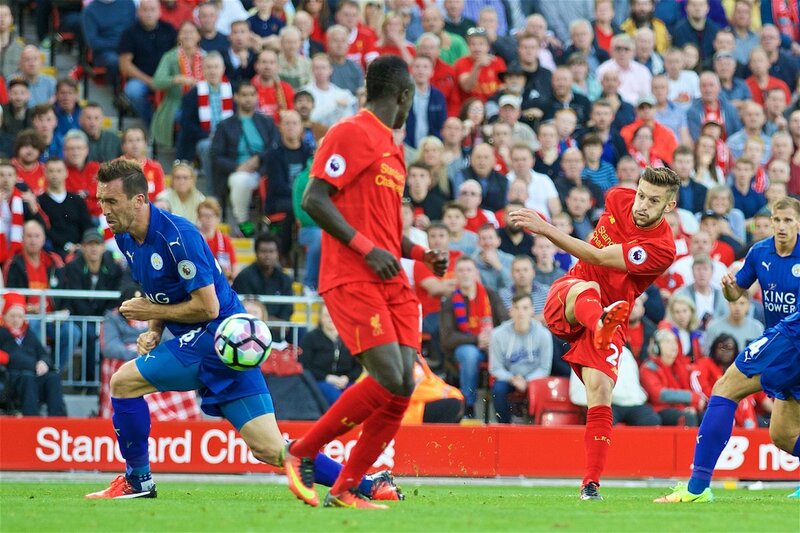 A wasted corner from Leicester allowed Henderson to spray a pinpoint pass forward for Mane, who had scampered forward in anticipation. Kasper Schmeichel had also scampered forward to carelessly slide in for the ball in no man's land 45 yards from goal. Mane skipped past the challenge and continued to burst forward before teeing up Firmino inside the box to finish an excellent move. The speed and energy of Mane factored hugely in Liverpool's performance today and in his appearances against Arsenal and Tottenham so far. The role of Daniel Sturridge in the victory is also one that deserves great recognition, as his guile and creative nous was evident with his eye for a pass and dummied runs to bamboozle the visitor's defence. As for Leicester, the champions will head into their first ever UEFA Champions League match on Wednesday night in Brugge both relishing the historic encounter and holding an ounce of worry in the back of their minds concerning their considerable drop in quality in the Premier League, as the Foxes look set for a difficult season.